WALTHER GEISER (1897-1993): Fantasie II, Op. 34, PETER MIEG (1906-1990): Concerto da camera, HEINRICH SUTERMEISTER (1910-1995): Marche fantasque, JÁNOS TAMÁS (1936-1995): Serenade, ERNST WIDMER (1927-1990): Quasars, Op. 69. Description: These works date from 1945 (Geiser's tone-poemish depiction of the war and its recent conclusion) to 1970 (Widmer's representation of the dense, starlike objects of its title - an explosion surrounded by quiet outer sections symbolizing the twinkling sky) are all tonal. Geiser and Sutermeister are quite late-Romantic although the latter adds pounding piano clusters for ominous effect in his 1950 Marche while Mieg's 1952 piece partakes of Honeggerian neo-classicism and Tamás' work of 1958, written only two years after he fled his home country, shows the influences of Bartók and Kodály. 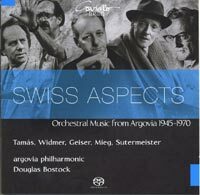 Argovia Philharmonic; Douglas Bostock.